There are many pros and cons when it comes to renting a car in Costa Rica. Some pros are that renting a car gives you the ultimate freedom and flexibility on your Costa Rica vacation. It allows you to change your plans last minute and also visit more remote attractions. Renting a car can help you get off the beaten path and avoid public transportation. On the other hand, renting a car isn’t the most affordable option and comes with a lot of additional responsibility. You have to worry about a deposit, insurance, parking, driving in heavy traffic and on curvy roads littered with potholes. Driving in Costa Rica can be tricky if you’re not used to it. If you’re planning a vacation with My Costa Rica, we recommend opting for shuttle or private transfer. We’ll take you door to door and you don’t have to worry anything! If you’re still unsure, keep reading to learn all about renting a car in Costa Rica! What do I need to rent a car in Costa Rica? You do not need an international driver’s license to drive in Costa Rica. You just need your passport and a valid driver’s license from your home country. The age requirements vary depending on the company, so make sure you check with the rental company. The youngest allowed is 21 (Budget and Alamo Costa Rica. Budget has an additional $10 fee per day for drivers 21-25). Other companies like Adobe Rent a Car require you to be at least 23. Hertz and Budget Costa Rica’s minimum age is 25. You have a few options when it comes to navigational systems or apps. Most car companies will offer a GPS system for an additional cost. However, there have been some complaints that they are a bit out of date. Car rental companies also offer wifi hot spots, which allow you to connect your phone. This is a great option because you can use Waze or Google Maps straight from your own device. You can also get pre-paid minutes on your phone and use your own data to use Waze or Google Maps. Read more about using your phone in Costa Rica. Be aware that apps tend to use a lot of data very quickly. READ VERY CAREFULLY when you’re selecting a car company and the insurance policy. It is common for companies to offer cheaper prices online and then surprise you with high additional costs when you arrive to pick up your car. For example, they almost never include the $20+ daily primary insurance which is mandatory nor the $10 a day for a GPS which is highly recommended. Some people may opt for an additional level of insurance coverage, which the rental car company will certainly try to sell to you when you pick up the car. You also need to remember that there is a security deposit that you need to pay when picking up the car with a credit card that can range between $750-$5,000 depending on the type of vehicle and insurance you select. Generally, the more insurance you buy, the less your deposit will be. How much does it cost to rent a car in Costa Rica? The cost of renting a car can vary dramatically in Costa Rica. For example, you’re likely to pay more if you visit between December and April (high season) than if you visited from May-November. The prices will also vary depending on the type of car you choose and insurance you purchase. If you are planning on renting a car, try to book it a few months before, especially during high season, and July-August. If you’re visiting during the low season (September/October), budget around $300 a week. If you’re visiting between January-February, budget between $500-600 per week. Around Christmas, New Years or Easter, expect to spend $600+ per week. Smaller compact cars are always cheaper than SUVs/4-wheel drive cars. When you’re considering what kind of car to rent, the big question is whether or not you’ll need 4-wheel drive. You must first think about where you’ll be going. If you’re going to Monteverde, the Osa Peninsula, Santa Teresa, Mal Pais, Montezuma, Uvita or Ostional, you will 4-wheel drive. In addition, if you’re planning on going to more remote beaches or hiking trails (in Jaco for example), it’s a good idea to get a car with 4-wheel drive. Getting to popular attractions in Guanacaste, the Central Pacific and the Caribbean doesn’t generally require 4-wheel drive. For example you can get to Tamarindo, Jaco, Arenal and Puerto Viejo in a regular sedan. In the Central Valley you’ll be fine with a compact car without 4-wheel drive. The majority of companies work with a 25-hour rental system. Meaning, if you rent the car for starting on Monday at 10 am. You will be asked to return it the next Monday at 10 am. If changes occur, there is a possibility you will be charged additional fees. In San Jose, rental car offices are all located within a mile of the airport. Some rental car companies offer complimentary transportation from the airport to the company and back, others charge for it. For example, Alamo Costa Rica charges $38. Adobe is free. You can also drop cars off at different locations throughout the country, but you’ll usually be charged an additional fee. In case you are pulled over by police and given a ticket, no need to worry! Just accept the ticket and provide it to the car rental company. The rental company will then forward you any additional fees. If an accident occurs, never move the vehicle unless the police tell you to. Don’t worry if it annoys other drivers! Report the accident to your rental car company as soon as possible. Automatic cars are more expensive to rent in Costa Rica. Most Costa Ricans drive manual cars. Always double check before you rent the car. 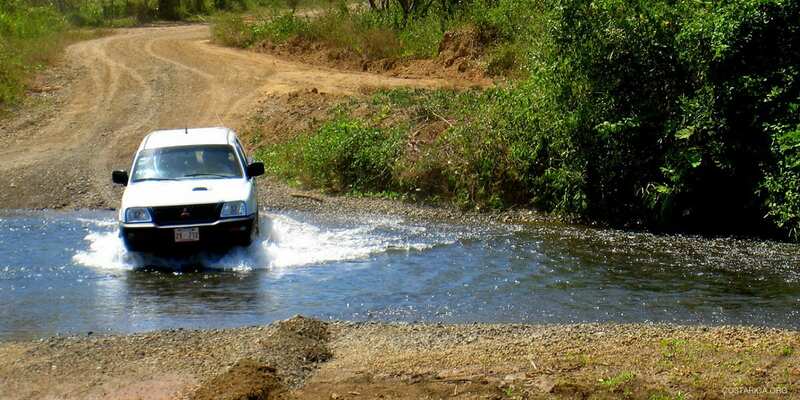 If you’re looking for more remote locations in Costa Rica, you might have to drive across some shallow rivers. DAMAGE FROM DRIVING THROUGH WATER IS NOT COVERED BY INSURANCE.